My grandma grew up reciting the Lord’s prayer, a prayer that has prescribed words. That was the only way she knew to pray. When she married my grandpa, she was introduced to The Church of Jesus Christ of Latter-day Saints (often inadvertently referred to as the Mormon church), and for the first time in her life realized that prayer was more than reciting a set of memorized words. Rather, prayer is direct communication with God the Father in the name of His Son, Jesus Christ. First and foremost, prayer is communication with God in the name of His Son. Under this general definition, we can pray at any time and any place. For us to understand and use the gift of prayer most effectively, we need to understand who we really are. We have the privilege of communication with Heavenly Father, because we are His literal spirit children. Do you like to call up your parents and talk to them? I do. When I talk to my parents, I like to tell them about my day, ask for their advice, and sometimes even seek comfort. Our relationship with God can be the same way. He loves to hear from us and hear what we have to say about our lives. Once we understand that we are indeed children of a loving Heavenly Father, prayer becomes natural and instinctual. After you begin your prayer, you should try to express gratitude. Prayers are a tool we can use to communicate our needs to God, but we should never neglect to say thank you. Do you feel underappreciated when those you serve fail to express gratitude? Our Father in Heaven is no exception. When we express gratitude to Heavenly Father, not only are we showing appreciation for what we have, but we also become more aware of other blessings and more in tune with a spirit of happiness and contentment. Sometimes I have prayers in which I offer only thanks. These are special prayers, because I’m consciously not asking for things and focus instead on expressing sole gratitude. These prayers help refocus my priorities and rejuvenate my heart. You can always ask Heavenly Father for blessings. Because He’s an omniscient God, He already knows your needs, but sometimes the blessings we need are contingent upon our asking for them. You can ask for immediate blessings, temporal blessings, and blessings of eternal consequence. You can ask questions about what job to take, what college to attend, whom you should marry, and when to have children. Bring your heavy-laden plate to the Lord and allow Him to take it all. He is always willing to take upon Himself our pains and trials, but we must first tell Him about what we need Him to carry. Confess to Him your weaknesses and insecurities, your concerns and worries. If you’re having a hard time in a friendship, tell the Lord about it, and ask Him for help and wisdom. Nothing is off limits in prayer. When you pray, you should use some of that time to repent and seek forgiveness. We all make mistakes and need to start over. Regardless of the seriousness of your sin, confess it to the Lord and allow Him to change your heart and guide you to the best ways to rectify your mistake. Some sins require guidance from your local ecclesiastical leader (for Mormons that would be a bishop or branch president) to reach full repentance. While sin may make you feel guilty or ashamed, always know that God loves you and issues commandments so that we can be happy. And because Jesus Christ suffered for our sins, we have the opportunity to repent from our mistakes and move forward. So much of the beauty of the grace of Christ is realized through prayer. In the Book of Mormon (a book of scripture complementary to the Bible) we learn that we must “counsel with the Lord in all [our] doings, and he will direct [us] for good” (Alma 37:37). Some of the things we encounter in the day don’t allow time for kneeling down in formal prayer. We can and should always have a prayerful heart, a heart that is constantly open to communication from God. I remember several nights when my new baby wouldn’t sleep, and in the middle of the crying and the rocking, I would plead to God to strengthen me and show me the way. Those prayers were just as effective as prayers said on my knees. 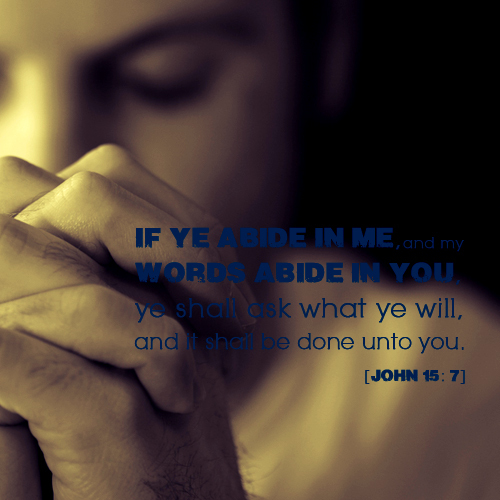 When you conclude your prayer, be sure to do so in the name of the Savior. Doing so not only acknowledges our need for Jesus Christ and His grace, but it also gives His stamp of approval on our words. When we pray we should always be seeking to know God’s will, and by closing our prayers in the name of Jesus Christ, we signal that we have done our best to know the will of the Lord. I have been praying my whole life, and I know that prayer works. Because of prayer, I have a knowledge of the gospel of Jesus Christ, and I know that my Savior lives. God has answered my prayers, and I know that He hears me every single time. If you are unsure about whether God exists or whether He hears you, take a few moments and offer a heartfelt prayer. He will hear you, and He will manifest His love to you. I know this.